Mounted on molded plastic base, the unit consists of a base into the top of which may be screwed one of a set of four vases of differing shapes. An aperture in the bottom has a thin rubber diaphragm across it, bearing upon the short arm of the lever pointer. A moveable index on the vertical rod enables the height of water in vases to be set at same level. 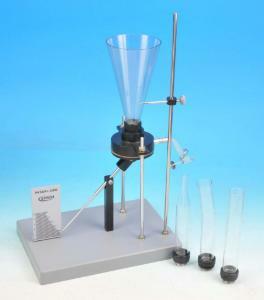 The apparatus is mounted on moulded plastic base that measures 25 x 17.5cm. The experiment is performed by screwing in each vase, in turn, and filling with water to the same level. It will be seen that the given height of water will result in the same deflection of pointer whatever shape of the vase.